Asked about my reaction to Walk the Line, I found myself repeating the same answer. I inevitably changed the subject to Joaquin Phoenix’s performance, which I praised to the skies. The movie itself was no more than a “Phoenix delivery device,” at least in my initial reaction. Walk the Line is a cookie-cutter biopic. It looks a lot like last year’s Ray, and I think some of the same cinematography has been lifted straight from other biopics like Men of Honor, with Cuba Gooding, Jr. There is the opening that shows noble-but-poverty-stricken home life; the childhood trauma that changes our hero forever; the budding career (Cash tours with Elvis, June Carter, Buddy Holly, and Jerry Lee Lewis). We have the usual scenes involving the emptiness of fame and wealth, the drug use (“Elvis takes them” — talk about peer pressure! ), the dramatic overdose, and the carefully chosen “happy” ending that — regardless of the movie — never seems to actually be the end of the subject’s life. As with Ray (which got Movie Habit’s highest rating, although not from me), the performance makes the movie. Ray didn’t deserve an Oscar, although Jamie Foxx might well have. The same goes for Walk the Line and Joaquin Phoenix. If you were to listen to Joaquin Phoenix sing (he does his own singing, as does Reese Witherspoon as June Carter), and then listen to Johnny Cash. You would immediately be able to tell the difference. But if you watch Phoenix on screen, you will be much more easily fooled. It’s not just the voice that made Cash, it’s the manner, the confidence, the dress, the hair, and a hundred other things, all of which Phoenix and his art department were able to nail. 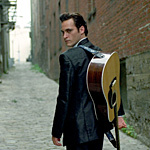 In addition to Phoenix and Witherspoon, there are many people who deserve praise for their work on Walk the Line. T Bone Burnett was in charge of the music. Sound designers fill the world with sounds that influenced Cash’s music. The scene is so on-the-nose that you can’t help but see the fingerprints of a screenwriter. And yet, even as you know it’s too perfect to be real, you have to admire the skill with which it was written. But in spite of all the good work in Walk the Line the movie itself is a bit overlong and entirely conventional. It still earns a recommendation, for the music, for the performances, and for the entertainment value. Just don’t mistake the quality of workmanship for the quality of the finished product.